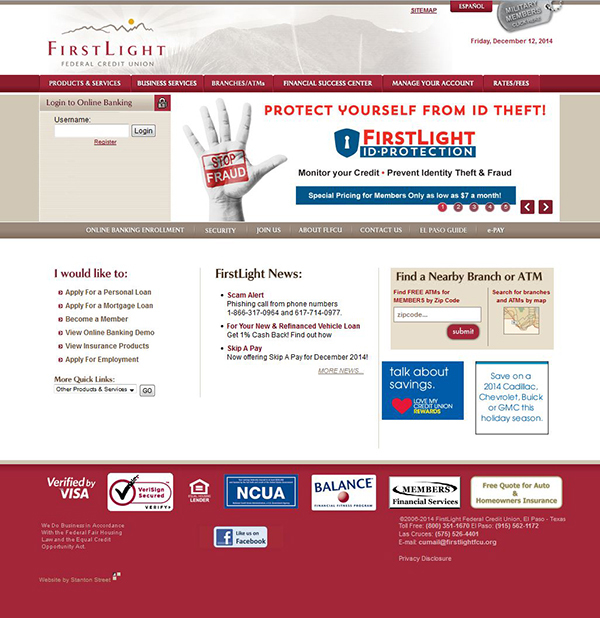 We’ll be the first to admit that FirstLight Federal Credit Union needed a revamp of their old website to bring it into the next century. Back when it was designed in 2008 it was definitely snazzy, but as with all things web-related – technologies, styles and techniques change. Once we received the green light for a redesign, it was full steam ahead coding away the last days of 2014. We rang in 2015 by launching FLFCU’s fresh new digs. The new homepage opens up with simple navigation in English with an option to view in Spanish. Looking for a job or want to contact FLFCU directly? The subnavigation sits directly above the main navigation highlighting that content and more. If you’re simply dropping in to login and manage your account, the secure login is perched prominently on the page. Homepage banners feature the latest news and content displayed throughout the site. 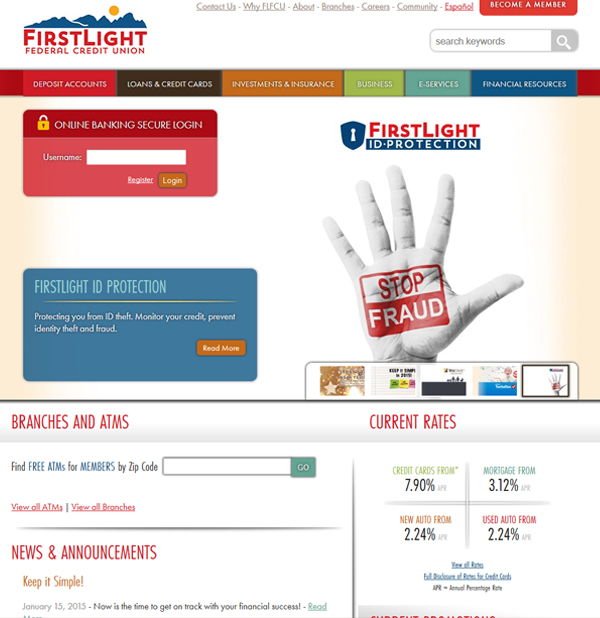 Users can also search for keywords or locate a nearby ATM or branch using the tools on the homepage. Rates, news and promotions are also readily available for users to interact with clicking over to their landing pages for more details. The “Become a Member” invitation soars at the top of the website inviting users to find out eligibility requirements for membership. Subpages provide the user with key information on the programs, services and products FirstLight has to offer for individuals, investors and businesses. The content links to related information on either internal or external websites for further information. The Financial Resources section provides users with several tools to help them learn more about finances, calculate loan payments or simply read up on the latest events and news from FLFCU. Does your website need a makeover? Fill out our contact form and we’ll make it snazzy. You can also give us a call at (915) 351-8440 to find out more.